I continue to be moved and deeply touched by this beautiful film from Italy, and I never tire of watching it. 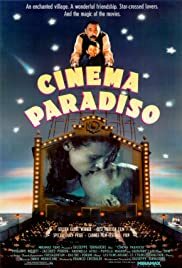 I share the lives of Toto and Alfredo, the small Sicilian boy, who loses his father in the second world war, and the older man who runs the projector at the local cinema. Toto lives in a world of make believe, movies, adventure. His dreams take him away from the small Sicilian village where he lives with his mother and sister. Alfredo becomes for him a surrogate father, and the movies, his paralell existence. It is a deceptively simple film, which sweeps you up and carries you along. You never want it to end. And, when it does end, it is with such heartbreaking simplicity, I cannot help being moved to tears. Young Salvatore Cascio is a marvel as the small Toto, a mischievous, impish, adorable child. 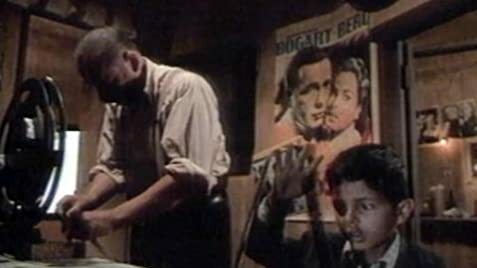 Phillipe Noiret is unforgettable as the sly and heart-warming Alfredo. You grow up with Toto, until he becomes a famous film director in Rome, and returns to the small village after many years for Alfredo's funeral. It is the story of life, lost love, devotion, friendship, and family. It is unforgettable.